A few days ago Libre Space Foundation, the Librecube Initiative and European Space Agency’s European Space Operation Center Cybernetics Team came together and co-organized Open Source Cubesat Workshop ’17 (or OSCW17 for short) at the European Space Operations Center Headquarters in Germany. For two days, the European Space Operation Center opened its doors to our community building open-source space technologies. We had the chance to watch, participate and get inspired by talks, pitches, and workshops that took place during OSCW. 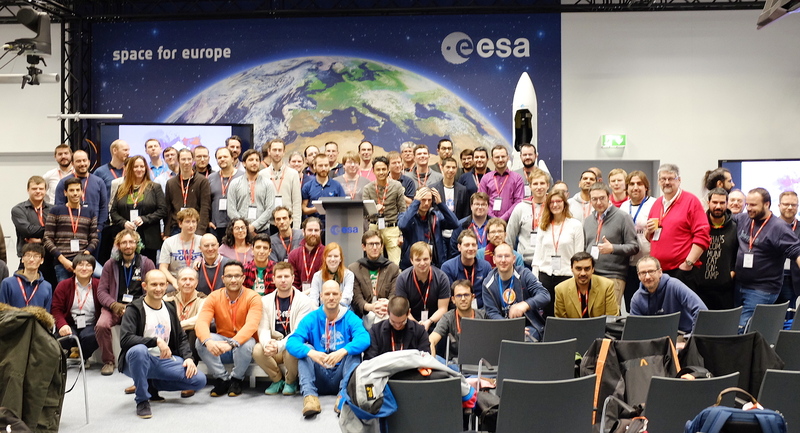 We want to thank our hosts, the awesome people of ESOC, its director that keynoted the event, the Cybernetics team, and numerous ESA volunteers that took time off their schedules to join us. would also like to thank the OSCW17 sponsors that placed their trust on open-source. And most importantly we must thank the awesome international community of researchers, industry representatives and individuals that joined us working together and collaborating on open-source space technologies. The ESOC media team made all video recordings available to share. We aren’t going single out a few talks, pitches or workshops, Feel free watch all the talks (abstracts and slides linked in the video descriptions) in the following YouTube playlist, and don’t hesitate to join our continuous work on open-source space technologies in our community discussion forum and chat room.